Discussion in 'Automobilista - News & Announcements' started by Renato Simioni, May 26, 2017. 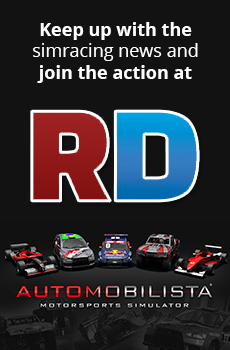 Automobilista v1.40 is released, along with a new DLC: Hockenheimring is also available for purchase here. If you are interested in other current & upcoming Automobilista DLCs however it is strongly recommended you check the AMS "Season Pass" for all upcoming DLCs (for those that already have the base game) and the bundle of AMS Base + Season Pass (which includes the base game). * The Custom Season Tool should be fairly intuitive to use - run the tool, select a series you wish to create a custom championship for, customize the calendar from all available track layouts, set up the scoring system (including option for separate points for multiple heat results, pole position, laps led), some basic rules and then save when you´re satisfied - your custom championship will then be listed in Championship mode for the series it was based on, and you can further customize it with the usual championship options in-game (opponent cars, opponent strength, race distance, number of heats, quali, tire / wear multipliers etc). ** Since arms are added as objects rather than 3D animation, they´re not articulated nor do they have gear shifting animations; for the same reason steering wheel rotation animation is limited to 90º in each direction when driver arms are installed; in some cars, driver arms configuration is merged with seat position and / or cockpit type; Most cars have visible driver arms from external view irrespective of whether cockpit configuration is used or not - exception being vehicles where this solution was not considered to look acceptable - specifically karts and Formula Truck do not feature driver arms. *** In case of series with drivers featuring in multiple categories (ex Barrichello who is a driver in V10, StockV8, Kart) in order to get the series-correct team / driver performance, tire wear and start skill, user is advised to select the specific series rather than All Cars / Tracks. If you have an online race tonight, you may stick to or revert to the previous v1.3.7 by selecting that branch from the Steam Beta tab. Further instructions as to how to do that here. For further difficulties related to installing, running or setting up the game, please refer to USER MANUAL present as a launch option from Steam If you need further assistance please post it inV1.0 troubleshooting topic or email support@reizastudios.com (please allow for up to 1 business day for a reply). You are very busy, indeed! Custom season tool doesn't show up in the launch options. Thanks for this massive update and all the work that went into it! AI improvements? Custom seasons!!? I'll be occupied for a long long loooong time. i cant get in the season tool, not through the steam launch options, nor through the ams install folder. it tries to start but keeps saying that there has been some sort of exception, and under it a list of errors. if i try it through steam, it wont even start. via the install folder it does open partially before coming with the errors. i will try to get some screenshots tomorrow, has i have to get some sleep now. i think the season tool is maybe a bit too much rushed as it only got in the beta today. At the risk of sounding repetitive.. We´re working on it, not quite there yet unfortunately. EDIT - restart of Steam resolves this as per above post. Thanks! Great update, so thank you very much! I'm especially looking forward to mucking around with the Custom Season and the new AI, as I play offline. Can't get the Season Tool to work though. Thanks again, and love your sim! Like the way Custom Season was implemented, aside and without clogging the current UI, plus probably easier to develop that way; it also does find all modded tracks which was a concern of mine going in, and liberates you from messing with the content text files. Hockenheimring is incredible !!!!!!!!!!!. Many Thanks !!!!!!. Hockenheim, short, long and old...fantastic...and the Ultimate is wicked. I suspect this is the result of having non-stock series. I get these errors in my regular install, but it works fine in the beta. I have only stock series in the beta. Interestingly, I do have Patrick's extra tracks in the beta and they do not cause a problem for the Tool. It works very intuitively and seems great from what can see after a quick tour. Is this error about my 32 bit version Windows 7 ? I also can't start custom season tool that the steam reminder me this tool can't run on 32 bit system. Custom Championship Tool not working for me, even after restart Steam. Any information about Steam achievements? Supposed to have been in this patch according to Renato. Disappointing, on Monday it will be 15 months since AMS hit Steam with achievements advertised as a feature. Edit: And to not just be entirely negative, AI improvements and custom season tool are greatly appreciated.